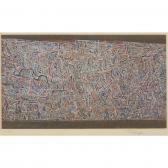 Find artworks, auction results, sale prices and pictures of Mark Tobey at auctions worldwide. MARK TOBEY (american, 1890-1976) "THE WOVEN WORLD" 1974, pencil signed and numbered 13/150 (there were also 25 artist's proofs), with wide margins, Transworld Art, Inc., New York, publisher. Lithograph on wove paper. 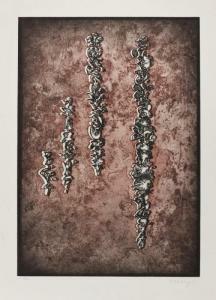 image (sight): 9 7/8 x 17 5/8 in. 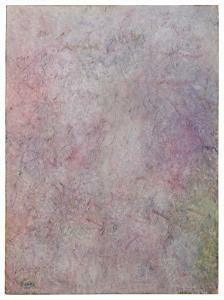 (25.1 x 44.8cm) note: This work is being sold to benefit Woodmere Art Museum's Education Department. 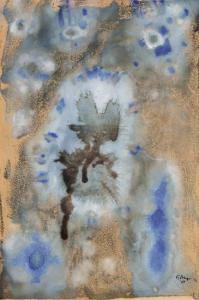 Mark Tobey (American, 1890-1976) Pattern, 1954 watercolor and gouache on paper signed Tobey and dated (lower right); signed, titled and dated (verso) 9 x 6 1/2 inches. This work is mounted to the face mat at seven point with toned clear tape from the verso; otherwise this work appears to be in overall basic good and stable condition. Framed: 15 x 12 inches. 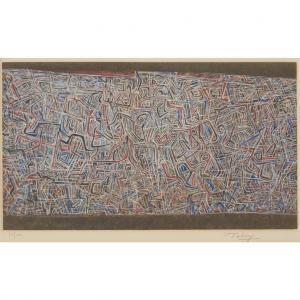 Mark Tobey Cat in the Clouds signed and dated "M. Tobey '57" lower rightgouache on paper17 7/8 x 11 7/8 in. 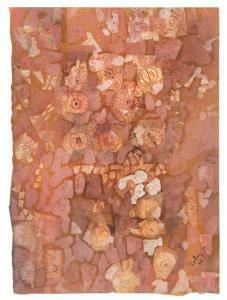 (45.4 x 30.2 cm. )Painted in 1957, this work is registered with the Mark Tobey Project, LLC under the identification number MT[138-2-9-11] and is listed in the Paul Cummings archive at the Mark Tobey Project, LLC.